With the end of the year just a few hours away, I thought it might be a good time to look back on 2010. This has not been an easy year around here, and in many ways, I am happy to see it go. 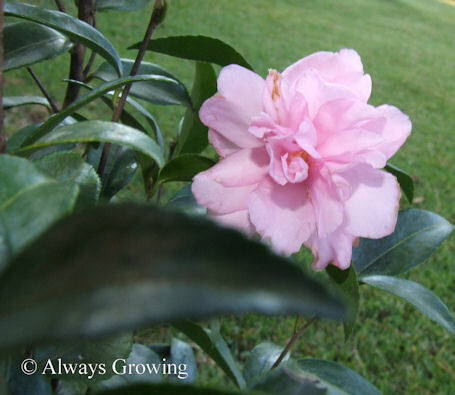 January brought unusually frigid weather which knocked many plants back. Several of these plants took months to recover, some taking until summer to show up. 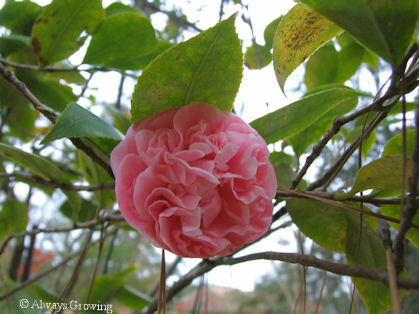 But, as soon as the cold weather was gone, the camellias were back and blooming prolifically. February brought a slow awakening as the temperatures returned to normal. Narcissus flowers started showing up along with other plants ready for spring such as the holly ferns unfurling their new fiddleheads. March brought flowers galore. 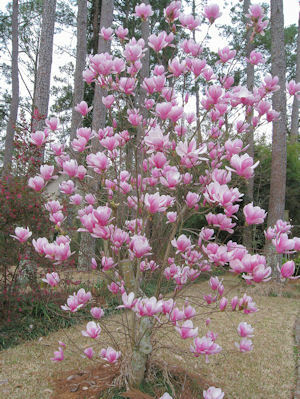 Daffodils, azaleas, flowering pear trees, and the lovely Japanese Magnolia. 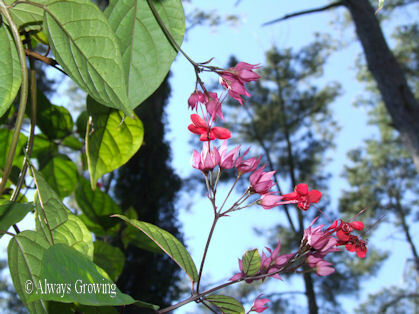 April showers brings May flowers to other areas, but April brought the high flowering season to the Gulf Coast. Azaleas, roses, irises, wisteria, and amaryllis all seemed to show up at once. 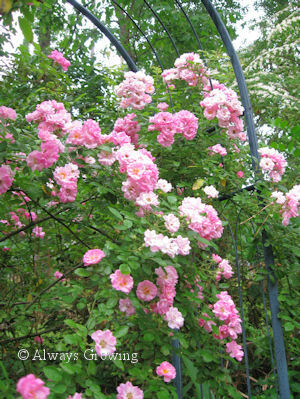 The pink climbing rose I received as a cutting from my mom was emblematic of the month. May brought lily season. There were day lilies, Easter lilies, Madonna lilies, plus others. Again, it is the old-fashioned ones from my mom that I like to remember best. June brought the beginning of our hot season, and while the temperatures were not as high as 2009, it was still very warm. The daylilies were still going strong and were joined by the hydrangeas, gladiolus, agapanthus and crinum. July brought on the heat and with the heat comes fewer flowers, but thank goodness for the ones that love the high temperatures. 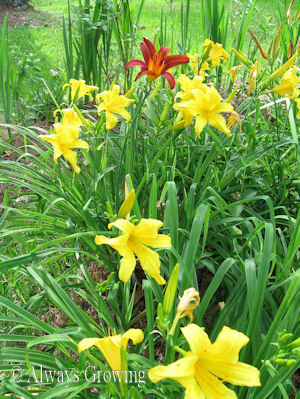 Daylilies were still blooming and were joined by the clematis, ginger, and hibiscus. August brings some of our highest summer temperatures, but while many flowering plants are on hiatus until cooler weather arrives, there are still some brave plants that bloom in the high heat of summer. 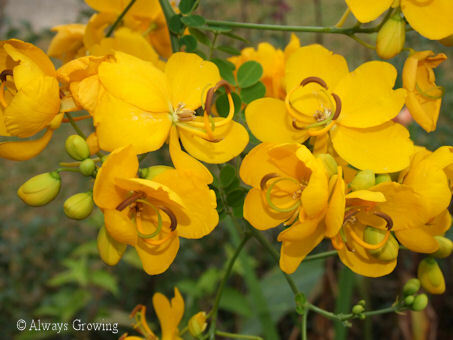 Usually, these flowers are viewed from inside an air conditioned house. 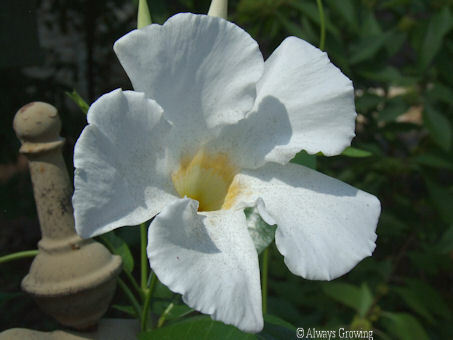 Thank goodness for the gardenias, gingers, cannas, night blooming cereus, and mandevilla vine. September brought more hot temperatures but with the waning of the month, you could tell that the high heat of summer was over. 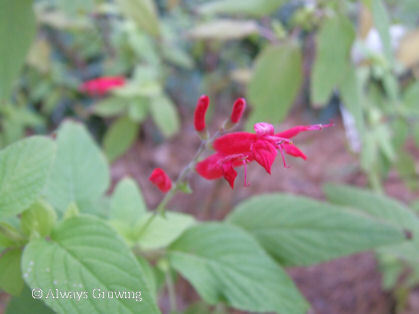 This month showed my first blooms of Sweet Autumn Joy, a new plant for me. Also continuing to bloom were the night blooming cereus, gingers, and cat’s whiskers. 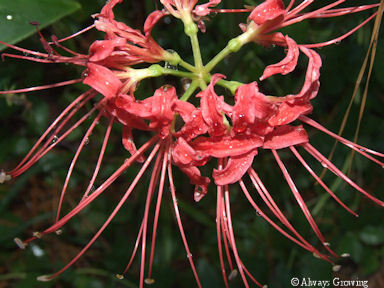 The first of the lycoris showed up towards the end of the month. 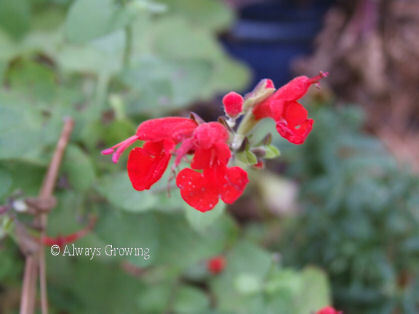 October brought cool temperatures and many plants start flowering again, but it is the fall bloomers that really stand out. 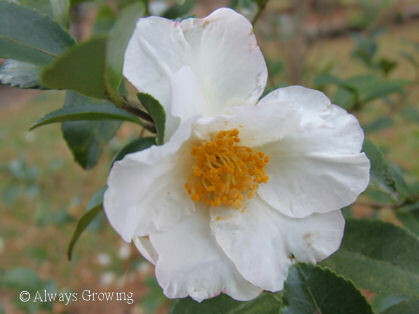 Showing up this month were Confederate Rose, fall blooming salvia, and cassia tree flowers. November brought lovely weather and, for us, that means cooler than normal. 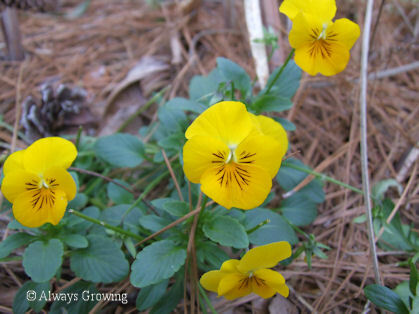 Cool flowering annuals that will bloom in the spring are planted during this month. 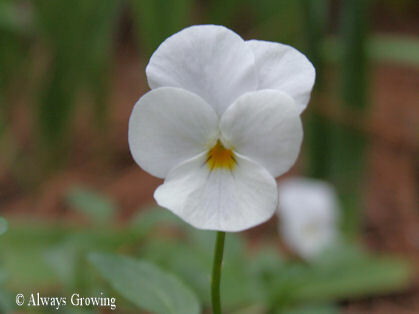 Violas, snapdragons, and petunias went in the garden this month. 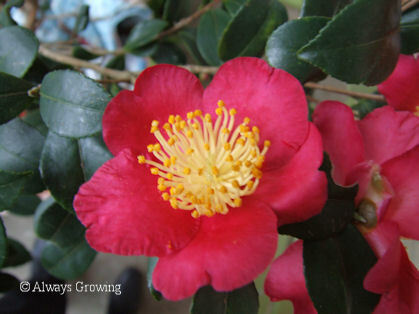 November is sasanqua camellia month around here, and we were not disappointed. With so much dying back this month, it was nice to have new flowers. Finally, we are down to December. 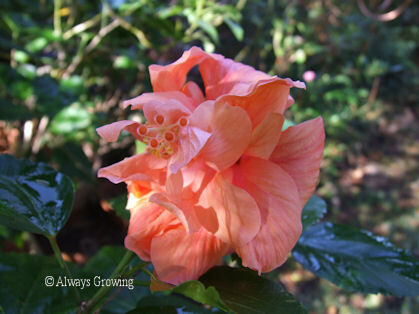 Early in the month, the hibiscus were blooming but late December brought unusually cold temperatures here as just as Mother Nature did to most of the country. 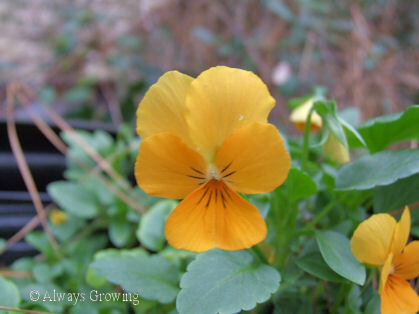 The violas, snapdragons, and petunias planted last month weathered the low temps with no problem. 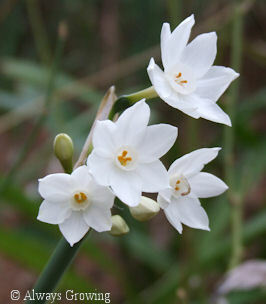 And, to close out the year, the paperwhites were blooming – so the cycle of the year in flowers begins again. Today is a rainy, deary day, and it was nice to look back and remember the lovely flowers that bloomed in my garden this year. As this year ends, I look forward to 2011 with the attitude that it is going to be a good year. Just like the rest of the country, we have had our cold weather, too. 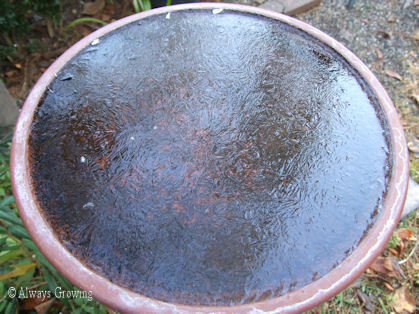 For the second morning, the birdbaths have been frozen solid. While we haven’t had the awful extremes of cold that other parts of the country have, it has been very cold here in the Gulf Coast. 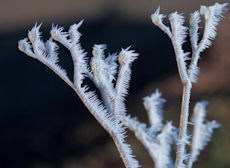 The last two days have had freezing night time temperatures for six to eight hours. Luckily, it only got down to about 25 degrees, but for this usually mild area, that is cold. I protected all my tender plants and everything seems to be fine. But, sometimes I am surprised by what survives cold freezing weather with no protection. 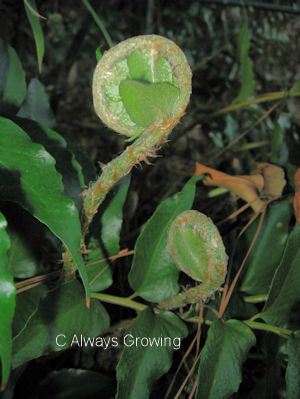 A good example of this is the macho ferns that sprouted in the ground next to a large container of the fern. 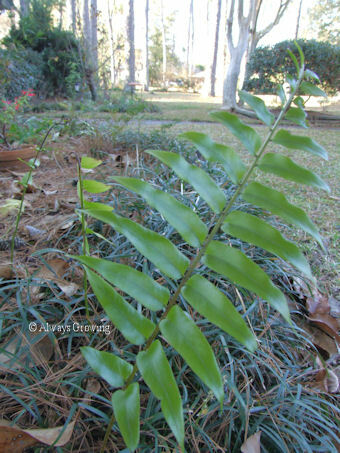 When I moved the container to a protected area, four little ferns were left. Even after the freezing temperatures, of the last two nights, these little ferns are still standing tall with the smallest only having a little freeze burn at the very tips. When it warms up, I’ll have to pot these babies up. Our extra cold weather that was predicted for Sunday night/Monday morning, never materialized, but tonight’s cold temperature of 20 will probably arrive with no problem. We rarely get this cold around here, and, on the few occasions that we do, it is usually in mid-January, not December. Well, this means good-bye to many of the tender plants. 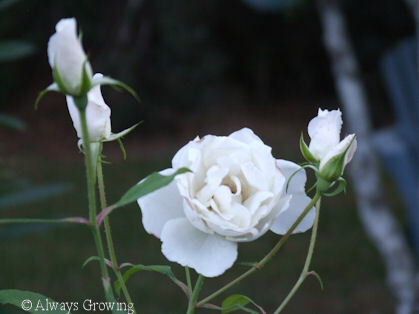 Of course, most will only die back to the ground and hopefully return in the spring. 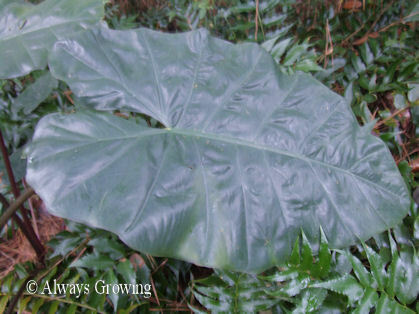 I would hate to lose the alocasia, Metallica. I have had this elephant ear for many years, and with last January being another unusually cold one, this elephant ear did not return until almost July. It usually is up by April at the latest. I am keeping my fingers crossed that come spring, this plant will once again send up shoots. It is disappointing to take a photo one day, and find the plant mush the next. I know the gingers will die back, as will the night-blooming jasmine. 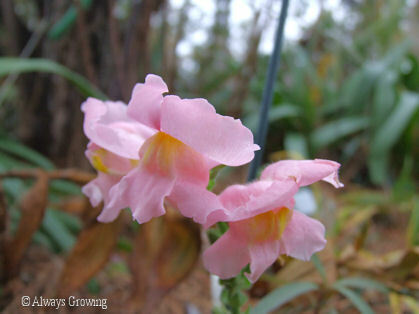 Most of the really tender tropical plants are protected and should make out fine. They may die back also, but return when the weather warms up in late February or early March. There really is nothing more I can do to protect the tender perennials or tropicals. Sunday afternoon was spent watering and covering up plants to try and help them survive the plunging temperatures. I do try to keep the attitude that if they don’t make it through the cold, it just gives me the opportunity to buy something new. We may have our first hard freeze here on the Gulf Coast tomorrow. As I was protecting my tender plants this afternoon and looking at the hibiscus flowers, I was feeling a little sorry to see so many lovely summer plants doing so well, but knowing their days are numbered. I will really miss the coleus. It did so well this year and was a great replacement for the flowering annuals that require so much water in our hot summers. I have a feeling this will be the last of the hibiscus flowers until next spring. 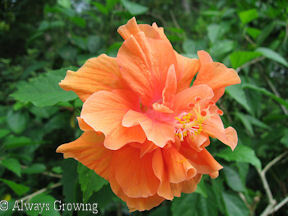 Most of my hibiscus plants are over seven to fifteen years old. 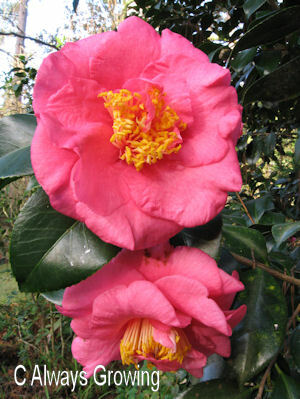 Every winter, I protect them because it is often hard to find the double ones in the spring. Years ago, they were everywhere, but now I rarely see them in the nurseries. 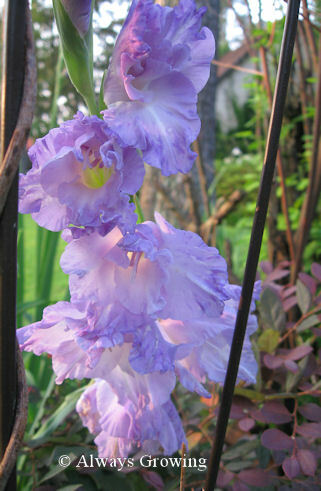 I can seem to find only the singles, and while they are pretty, the doubles have stolen my gardening heart. To overwinter the hibiscus, I will cut them back and cover them with plastic sheeting. This is usually enough for the freezes we have because the below 32 degree temperatures rarely last more than four hours, and then we warm up enough to uncover the tender plants. If we have a really hard freeze of six or more hours, then I carefully put a light bulb under the plastic. This is enough to keep them from freezing. 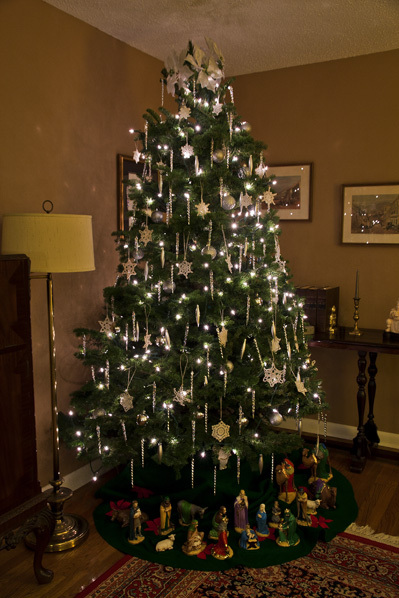 (I don’t know what I will do when incandescent bulbs are no longer available.) On the very rare occasions, every ten years or so, that we will not be above freezing for a few days, they will come into the garage. 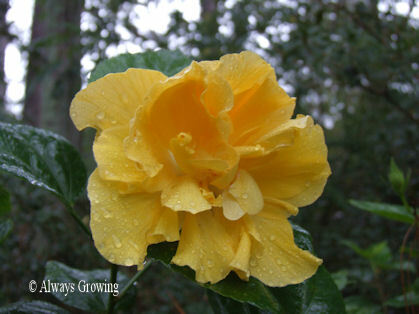 While the hibiscus plants will lose most of their leaves in the winter, come spring they bounce back fairly quickly. 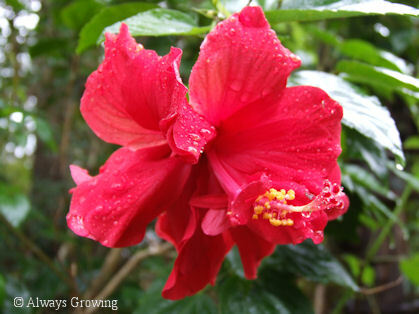 Over the years, I have lost a few hibiscus plants even with these precautions, but if I get low on one color, I will root cuttings to ensure I always have my doubles. I know this is sometimes a lot of trouble for an inexpensive plant, but after all these years, they are irreplaceable to me. Holding on to life. It never ceases to amaze me how nature clings to life. Plants that continue to grow under hostile conditions such as concrete parking lots makes me realize how tenacious Mother Nature is. How many times have we seen plants that haven’t been watered, that have been exposed to too cold weather, or just plain forgotten, thrive? And yet, how often the pampered and well-tended plants die? The other day, when I was walking around the garden, I saw a little sunflower seedling sprouting in the most unlikely of places. The birds must have dropped a black oil sunflower seed in just the right way for it to find this spot to start growing. 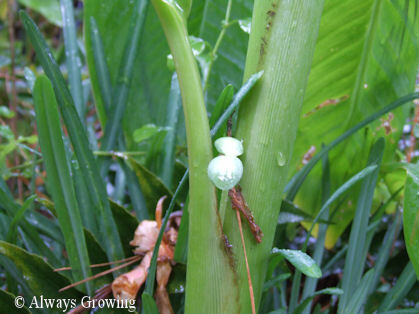 Yes, this little seedling is growing in the leaves of a ginger plant. As you can tell from the photo, there had been some rain which must have been enough to get the seed growing. Unfortunately, I can’t imagine this sunflower seed growing big enough to flower. There just isn’t enough nutrients in a ginger stem, and winter with its accompanying cold weather will soon be here. Should I gently try and plant it in soil? It certainly seems worthy of a fighting chance. What this little seedling does remind me of, however, is how tough these seemly delicate little things can be. Life demands toughness. A lesson we all have experienced one way or another. This morning was our first freeze, and while it was a light freeze, it brought to mind the first stanza of this poem. It won’t be long before colder temperatures stay around for longer and longer periods.